Back on December 31st, 2011, famous author Neil Gaiman posted this New Year’s Wish on his website. Why would Neil actually hope we will make mistakes? And why am I mentioning a New Year’s Wish with the year already well underway? The first thing I thought of when I first read this quote was my epic struggle with 365-day challenges. I’ve tried doing plenty of 365-day challenges over the years, always starting at January 1st. Each time, I was lucky to make it to late January, and often not more than a few days. Obviously, I made a mistake forcing myself to start at the beginning of a new calendar. But that’s not the biggest mistake that I make when it comes to making resolutions about the coming year. I’ve never really been into the whole New Year's Resolutions thing anyway. Obviously, my biggest mistake is to be afraid of making mistakes. No one is perfect, and it doesn’t make sense to try. As Yoda so famously said in Star Wars: The Empire Strikes Back: “Do, or do not. There is no try.” We all want to try and don’t just do. 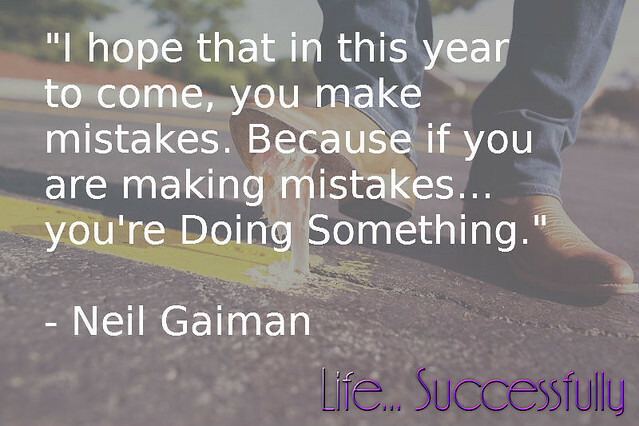 If you’re making mistakes, as Neil explains, “then you are making new things, trying new things, learning, living, pushing yourself, changing yourself, changing your world.” The trick, as I’m sure he implies, is that you need to make new mistakes. It’s simple: as long as you’re making new mistakes, you’re doing something different. The great thing about resolutions is that you can make them everyday. Resolving to make new mistakes every day might sound strange, but it makes sense when you really consider the opportunities that can come from making them. You get to learn more about yourself, pushing your own limits, and giving yourself the opportunity to teach others. So if you made a New Year’s resolution already this year, how is it going? However it is going, you have to resolve to do it everyday, correct? Well, what if you miss a day? Does that mean you really failed? Or is it simply an opportunity to teach yourself why you didn’t follow through with your resolution. Perhaps, you found it too unrealistic.Well, making mistakes is a very realistic goal. You just have to be sure you’re making new ones. That’s progress, at the very least. It’s really rather arbitrary to resolve to do something starting on New Year’s Eve, but it is sure a convenient time to do so, isn’t it? Life is pretty much never going to be convenient, though, so you may as well start now resolving whatever it is you’re going to do. Does that mean we should purposely make mistakes? Certainly not. It’s that we have to face our fears of making them. What do you think you could do today that might be a fantastic mistake? As long as we’re doing something, we have the chance to royally screw up. And that’s OK. because we’re only human.